"Give a trendy look to your passport and protect it"
We are delighted to offer attractive Passport Covers for safekeeping of your Passport, an essential travel document. The Passport Covers are uniquely designed keeping in mind the travel requirements of contemporary travellers and ensuring protection of the Passport during travel as well as storage. 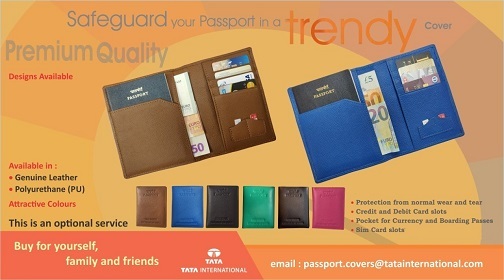 Passport Covers are manufactured using quality Polyurethane(PU) and leather by Tata International Limited (TIL), India's leading manufacturer and exporter of leather delivering world class quality products to consumers since 1962. The quality material and exquisite workmanship ensures you get a rich feel while the attractive colours offer a trendy look to the Passport. It also has sufficient slots for holding currency, boarding passes and Credit/Debit/Sim* cards. Passport Covers are available in two designs and are priced differentially to suit different segment of citizens. Standard design - Available in genuine leather and Polyurethane (PU). Premium design - Available only in genuine leather. * Sim card slot available only in premium design. Prices are inclusive of courier charges and applicable GST. STEP 1: Express your interest at the Token or at 'A' counter in the Passport Seva Kendra (PSK). STEP 2: Select the desired Cover and pay at 'A' counter. STEP 3: Get the Passport Cover delivered at your doorsteps. Passport Cover service is facilitated by Tata Consultancy Services Ltd. (TCS) (under the value added service, as approved by Ministry of External Affairs (MEA), Government of India) on behalf of Tata International Limited (TIL). The Passport Cover will be dispatched by TIL through courier/speed post directly to the applicant's correspondence address, as given in the application form, within 15 Business days of successful payment for the same at Passport Seva Kendra (PSK). Timely delivery of Passport Cover is dependent on the correctness of the correspondence address provided by the applicant in the application form. Delay or non- delivery due to incomplete or incorrect information provided in the application form shall not be TIL's or TCS' responsibility. Passport Cover service may be discontinued at any time without prior notice. TCS/TIL may change the design and/or charges payable by the applicant from time to time, in consultation with MEA. TIL/TCS is not responsible or liable for refund / replacement of Passport Cover except for the manufacturing defect which will be dealt on case to case basis, by TIL.